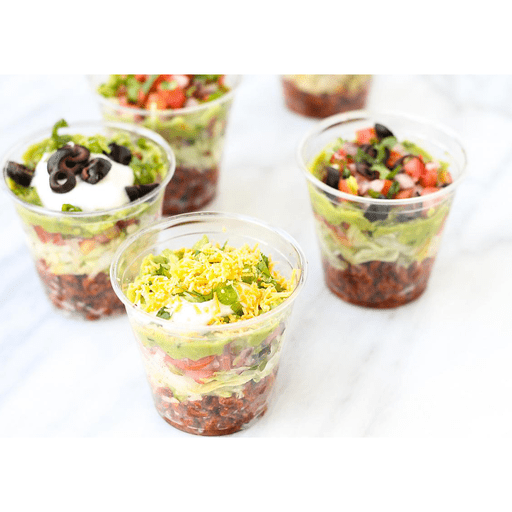 Perfect for tailgating, homegating or just a fun way to eat a family favorite, these Mini Taco Cups are easily customized to meet the tastes and preferences of your guests. 1. Cook ground beef in a large skillet over medium high heat. Add taco seasoning according to package instructions. 1. Divide taco meat mixture evenly into cups. Layer with your favorite toppings and enjoy! Top with shredded lettuce, shredded cheese, guacamole, pico de gallo or salsa, nonfat plain Greek yogurt, chopped tomatoes, sliced green onions, sliced black olives, sliced jalapenos. Serve with tortilla chips or simply eat right out of the cup. Note: Nutrition facts for this recipe will vary depending on the toppings used. Nutrition facts for this recipe will vary. *Nutritional values are an approximation. Actual nutritional values may vary due to preparation techniques, variations related to suppliers, regional and seasonal differences, or rounding.